Oleaginous yeast Yarrowia lipolytica is capable of accumulating large amount of lipids. There is a growing interest to engineer this organism to produce lipid-derived compounds for a variety of applications. In addition, biosynthesis of value-added products such as carotenoid and its derivatives have been explored. 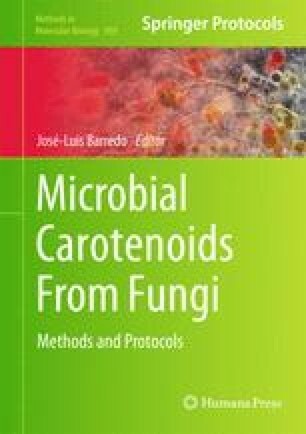 In this chapter, we describe methods to integrate genes involved in lycopene biosynthesis in Yarrowia. Each bacterial gene involved in lycopene biosynthesis, crtE, crtB, and crtI, will be assembled with yeast promoters and terminators and subsequently transformed into Yarrowia through random integration. The engineered strain can produce lycopene under lipid accumulation conditions.